Enfranchised Commander players generally know the staples of the format, the cards for each color that go into basically any deck that can cast them. Cards like Cyclonic Rift, Swords to Plowshares, and Sol Ring. We simply put them into our decks because they're powerful and they consistently deliver. Except perhaps the most competitive players, we also have our pet cards that we play purely for the enjoyment of them. Sweet, splashy cards like Mind's Dilation and Selvala's Stampede come to mind for me and I expect something similar comes to mind for you. Over my years of playing Commander I've had a few cards evolve from pet cards or "until I can find something better" cards to full-fledged staples in my decks, and I think the community at large could benefit from including them more often in their lists. Before I go singing the praises of this card, I will concede that it has a restrictive mana cost. Triple black is not trivial, It won't be reliably castable in every deck but in those that can manage it it's a very worthwhile inclusion. I'd like to compare it to two other cards that we know to be powerful to illustrate why. Of the two cards that the Demon is most reminiscent of, the first is clear just by looking at the cards side-by-side: Massacre Wurm. If you play Standard you may have immediately noted the similarities between the two cards, but I had to play with both cards quite a bit before I realized how similar of an effect they could have on a game. Both of these cards essentially threaten to allow you to untap and begin generating a very dangerous amount of value from the graveyard. You may think this comparison is far-fetched given that the Demon asks you to invest 4 energy with each activation while Scarab God only asks for a total of 4 mana, but I've found that the play patterns often work out in such a way that the cost is very easy to work with since the Demon also generates energy when other creatures die. It's common for me to just spend a turn reanimating Fleshbag Marauder or Merciless Executioner two or three times (in a typical pod of 4 these creatures will generate 4 energy each time their trigger resolves), clearing away my opponents' creatures and setting me up to start reanimating the strongest of them. I understand if you're skeptical, I certainly was when I was first trying the card. It's hard to believe that a big clunky 6 mana creature that dies to all removal and that only does something if you untap with it is good enough for a powerful format like Commander. However, consider the kinds of decks that want this card: black-heavy decks that emphasize getting value from the graveyard. Decks like this are already playing cards like Animate Dead, Victimize, Dread Return, and the like. All of these are ways to get the cheat the Demon into play quickly and/or repeatedly, and have the mana to activate it in the same turn, mitigating some of its clunkiness. Of course, as a compliment to these reanimator spells, these decks are also playing powerful creatures to reanimate cheaply for value; the Demon can serve as repeatable cheap reanimation spell for these creatures. Simply put, the Demon slots in perfectly as both a versatile, board-impacting reanimation spell and target. Demon of Dark Schemes is currently played in only 2.4% of black decks according to EDHRec (that's less than even more dubious cards like Tree of Perdition and Pontiff of Blight), I think we can do better than that. Try it out! Tendershoot Dryad is a pretty straightforward creature. It's hard to get super excited about, but it does what it does and it does it well. When first looking at the card it seemed perfectly fine, I assumed it would be serviceable in some number of Commander decks but not particularly impressive. Comparing the hefty mana cost of Verdant Force and the addition of an double-anthem effect on Tendershoot, it seemed like a clear upgrade for decks that were playing that card at least. I initially tested it in my Nissa, Vastwood Seer deck, a typical mono-green list: elves, Cultivates, Regal Force, Triumph of the Hordes, and other such cards. As it turns out, an unanswered Tendershoot on turn 3 or 4 off of an elf or Rampant Growth works very well with basically all the payoff cards in your typical mono-green deck: Shamanic Revelation, Collective Unconscious, Pathbreaker Ibex, Craterhoof Behemoth, Chord of Calling, Kamahl, Fist of Krosa. It just works with everything! Additionally, if unanswered for just a turn cycle or two it creates enough bodies that it can single-handedly require a Wrath of God effect to cleanly deal with, and there are few things I'm more excited about in my mono-green deck than trading one threat for an opponent's sweeper. If it is answered quickly, no worries, it's only one of many efficient threats your typical mono-green deck is going to be deploying. Along with being clearly strong in mono-green decks, it slots into plenty of other archetypes. 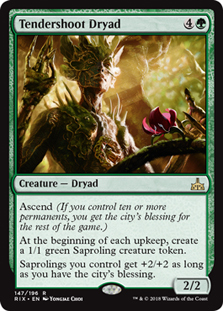 Obviously, Saproling-themed decks will never turn this card down but also most green-black or green-red based Commanders are perfectly happy to have an effect that can generate this many sizable bodies this quickly as it synergizes well with many of the other commonly played cards in those decks, much like it does in mono-green. While Tendershoot Dryad won't always be an amazing explosive play that the table can't answer, it does most of what you should be looking for in an efficient midrangey threat in Commander: a high ceiling and a solid average case. The floor on this card is fairly low as it doesn't provide value as soon as it enters the battlefield, but in my experience the Dryad lives through three or four upkeeps pretty regularly before it becomes a significant concern for the other players. Considering this card is a new addition to the format out of Rivals of Ixalan it's not surprising the number of decks playing it is low (just 0.06% of green decks have it! ), but I expect that number to rise steadily as it recieves more recognition. Reality Shift is a card I've felt has been consistently underrated ever since I started playing Commander, right around the release of Fate Reforged where the card was printed. I opened a few boxes of Fate when it released and quickly slotted whatever cards I could into my one Commander deck at the time, Ephara, God of the Polis. Reality Shift stood out to me quickly as a card that belonged in any of my blue decks that wanted to be playing much spot removal. Now, full disclosure, I have since removed Reality Shift from that Ephara deck since the removal suite is already covered by the more efficient white removal that Ephara has access to (as well as one Crib Swap for sick synergy with Vedalken Aethermage), but for decks that can't play Swords to Plowshares and Path to Exile, Reality Shift is a great card to have access to. In all fairness, Reality Shift sees more play than any other card on this list at 7.8% of blue decks, but that is still less than Rapid Hybridization and Pongify which I believe are generally worse cards. To be clear, I think these cards are fine, very playable, but on average worse than Reality Shift. In certain metas, Pongify and Rapid Hybridization being one mana cheaper can change everything; if I'm expecting to face fast, creature-based combo when I sit down at the table (not at all uncommon), I certainly want the cheapest interaction possible. Generally, however, so many Commander decks play graveyard recursion that simply destroying a single creature with a spot-removal spell often just Delays the inevitable. 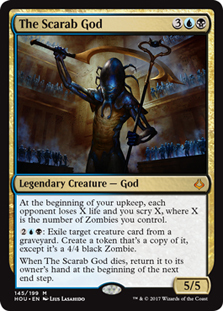 If the creature is good enough for you to remove it, it's probably good enough for the opponent to Reanimate, Eternal Witness, or Karmic Guide it back. Permanently exiling key threats (especially combo pieces) is exremely strong and can occasionally hamstring their entire deck if the right creature is hit. In regards to the downside of manifesting a card for the opponent, it may seem like a dangerous thing to do but in practice the manifested body is rarely an issue. The 2/2 face-down body is, as you might imagine, are less relevant than the 3/3s that are made from Pongify and Rapid Hybridization (which I've found especially relevant only when there are planeswalkers to attack). In all my games over the last couple years of consistently playing Reality Shift I would estimate I've seen the manifested creature flipped maybe 5% of the time, and the number of times the creature did anything more than just be a slightly bigger creature I'm confident I could count on one hand. One time it was an Ulamog, the Infinite Gyre though. This card is great. It's the ultimate trump card in a midrange value-battle, it's a reasonably efficiently-costed body, it's a persistent threat, it's protection for your key cards. It does everything you want, and it does it at a very reasonable cost. This is a green Deadeye Navigator that is worse at going infinite but better at protecting your board from sweepers. I've had countless games where this card carried me by allowing me to repeatedly Reclamation Sage or Acidic Slime my opponents out of the game. If you're flooding out, not an uncommon occurrence in mana-heavy green decks, Temur Sabertooth provides one of the best mana sinks you could ask for. Repeatedly replaying something as small Elvish Visionary can keep you competitive in a game where you might otherwise have stalled out and died. It scales well with the game and your boardstate, allowing you to get repeated value off of Avenger of Zendikar, Regal Force, Fierce Empath, or whatever other impactful enter-the-battlefield triggers you might have. And these cards are just a few of the strong payoffs that come to mind in specifically mono-green decks; the array of creatures that pair well with Sabertooth only grows as you have access to more colors. Mulldrifter? Angel of Serenity? Shriekmaw? Zealous Conscripts? All great with The Tooth. That is to say nothing of the work it puts in protecting your board from removal. Generally, I think building out a lethal board and hoping to untap with it is a losing strategy in Commander, but with enough mana Temur Sabertooth allows you to present the same lethal board multiple turns in a row and demand specific kinds of removal that your opponents are less likely to have. Currently, Temur Sabertooth is in only 3.5% of green decks on EDHRec, which I think is criminally low for such a versatile and powerful creature. I have strong feelings about this card. Regal Behemoth is one of the strongest Commander cards to be printed in recent memory. I originally tested it out in a big-mana Mayael the Anima deck but as it continued to impress I have slowly added it to more and more of my decks and now have it in every green deck I own. Afer playing with it consistently for over a year now, I'm of the opinion that Regal Behemoth is better in most every way than the Grandaddy of Groans himself: Vorinclex, Voice of Hunger. Vorinclex is great, don't get me wrong. I play him, he's great and I'm rarely unhappy with it as a card in my list. However, if I'm playing a a card, especially a creature, to double my mana I want it to do that as quickly and as consistently as possible. Regal Behemoth costing a full 2 mana less than Vorinclex is extremely relevant considering your mana is immediately doubled when it hits the battlefield. This means on the turn you would be tapping out to cast Vorinclex you instead get to cast Regal Behemoth and have 4 mana available to protect it, or to start doing whatever you planned on doing with your newly doubled mana. Whatever broken things your deck wants to do, you can do a full two turns earlier by just using Regal Behemoth instead. Setting aside the difference in mana cost, perhaps biggest difference between Vorinclex, Voice of Hunger and Regal Behemoth is that Regal Behemoth doesn't also hamstring your opponents' mana. While that is a fair criticism, I don't think it's enough to completely tilt the scales in Vorinclex's favor. If you're playing Vorinclex specifically for his disruptive ability (or consistently cheating him into play in the first few turns) that's fine and you should probably continue using him because few other cards will provide this same effect. However, if it's just incidental value on top of your mana doubling then Behemoth plays the role of efficient, fair mana doubler much better. The Behemoth also has the advantage of not completely ruining your political position at the table, increasing the likelihood you can untap with and actually get to do something (this is very dependent on your particular playgroup). The last major difference between the two, that Regal Behemoth makes you the monarch, should not be discounted. The monarch mechanic is a somewhat underappreciated in our format. The fact that Phyrexian Arena is the 20th most commonly played card in the entire Commander format (according to EDHRec at the time of this writing) should be a testament to how strong drawing an extra card each turn is. 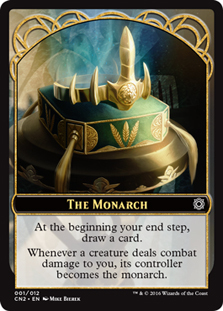 Notably, the monarch draw trigger happens at your end step rather than upkeep as well so you don't even need to untap as the monarch to get some value. Becoming the monarch also introduces an interesting dynamic to the table; it's not uncommon for your opponents to just take the monarchy from you in order to turn off your Behemoth. This is obviously less good than if the Behemoth simply couldn't be turned off, but it's quite a bit better than if your opponents consistently fired off their removal on it, a common fate for Vorinvlex, as you can set up to get back the monarchy and cast your big spells all in one turn. It's worth mentioning that the 5/5 trample body the Behemoth provides can be sufficient to allow you to maintain your monarch status against some decks. While I have Regal Behemoth in all of my green decks, it is one of the cornerstone cards for my Rashmi, Eternities Crafter deck. Blue-green decks have the unique ability of being able to play the Behemoth and play Clone effects. Since Regal Behemoth isn't legendary (unlike a certain Voice of Hunger), you can relatively easily triple, quadruple, or quintuple your mana. When your mana is already doubled, setting up a Progenitor Mimic or kicking a Rite of Replication on your Behemoth is not hard. It is, however, extremely fun. At the time of this writing, Regal Behemoth is only played in 1.4% of green decks, which is absurdly low given how powerful the card is. If you only try one card on this list, I strongly recommend slotting the Behemoth into one of your green decks. Despite only being printed once, in Conspiracy: Take the Crown, it's easy to pick up a copy for just $2 or $3 and it is quite worth it. I love all these cards, but I'm not always right. I want to hear from other people from different metas and with different playstyles. Have you tried these cards? Are they as good as I think they are? Are they far worse than I say, and I'm stupid for suggesting them? Cool! I want to know. Fire away at me on twitter, @blatant_stevery. FNM End Boss prepping for the Commander Pro Tour. I have strong opinions on EDH and nothing else.